The ado-mode is a major [editing] mode for Emacs which allows truly good editing of Stata, namely do, ado, sthlp, smcl, and mata files. Here is a screenshot to see what the highlighting does. The mode also handles indentation, date stamps, and includes templates for writing help files, project do-files and the like. Emacs versions 25 and 24.1 are supported. Here is the change log which says what is new. The current version is 1.15.1.5, which is made for Stata 15.1. It works just fine with earlier versions of Stata, but it will highlight commands as though you were using Stata 15.1. Here are the things which make life easier when using the ado-mode. ado-mode can communicate well with Stata itself, sending code directly to Stata for evaluation. This works macOS, and MS Windows and Linux. Ability to open any file on the default ado-path, even automagically opening the ado-file for the current command. Context-sensitive highlighting keeps typos to a minimum. Stata's commands and keywords are highlighted if abbreviated correctly. Commands which need subcommands are highlighted differently, so that you know a subcommand is needed. 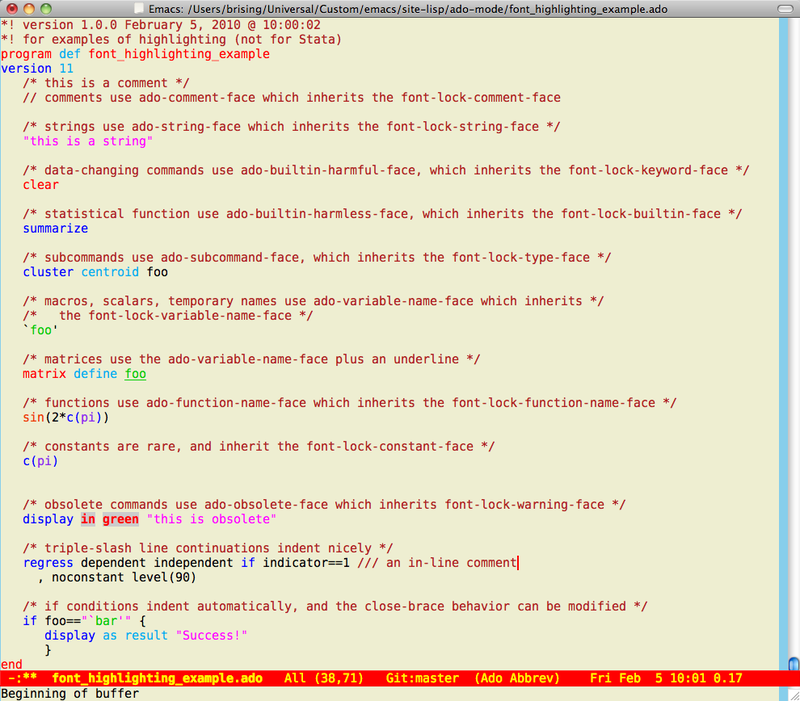 Downloaded and personal user-written commands can be automatically highlighted once Emacs knows where they are kept. Templates for common files, such as do-files which keep their own logs, ado-files, do-files made for testing and debugging ado-files, and (most importantly, perhaps) Stata help files. Automatic indentation so that long if, foreach, forvalues, and while blocks get closed. Many types of indentation styles are supported. Along the same lines, you can open Stata help files (in Stata, of course) from Emacs in Mac OS X and MS Windows. The name of the ado file always matches the name of the program defined, even if you change the program's name. Ado-files get a time stamp which can be formatted in a variety of ways. Stata's smcl directives are correctly highlighted, which saves time when writing help files. Parentheses, braces and double-quotes are balanced. The zipped current version can be obtained by clicking here. Even better, you can grab it from github: https://github.com/louabill/ado-mode. This makes both updating and reporting bugs a zillion times easier. Anyways, here are the installation instructions. Please let me know if there are any troubles with the installations, since there are little quirks with cross-platform Emacs stuff. If you are curious about Emacs, here is some more info. It is very dated, but it conveys the feeling well. If you are sold, and want to get a copy, here are more instructions. If you are intrigued about using editors for editing Stata code in a nicer way than the built-in do-file editor works, try checking out the unofficial FAQ on text editors and Stata.